Breathing techniques are the first ally every person has to relax and calm down. The busy and stressful daily life often moves people away from the connection to their breathing. Getting in deep contact with your breath can be a challenge, but it’s the most fantastic way for a better life. Right now, you might be asking yourself how to start. It’s a fair doubt if you haven’t practiced any breathing techniques previously, but the answer is quite simple: breath! Breathing techniques must always be performed under your comfort zone. While with other methods you want to challenge yourself, when it comes to breathing is more than important that you don’t exceed your limits. Any signs of stress and anxiety must be considered, and you must take a few steps back once it happens. To start, you must consider that right now you might not be familiar with your breathing. That being said, you can spend a few days just observing your breath! The idea is to do it without any judgement, you only want to understand your patterns and how is your breathing, if deep or superficial, slow or fast, with an attitude of curiosity and acceptance. Once you feel comfortable looking into your breathing and staying with it for some minutes, it’s time to start with abdominal breathing. 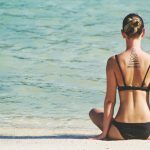 Abdominal breathing, although it can be seen as a beginner’s technique, must always be a tool you go back to when you face challenges with breathing techniques since it is the easiest way to calm down and get in connection with your breathing again. Abdominal breathing consists in bringing the air into your belly when you inhale and your stomach towards your back when you exhale. Even though it can be performed while you lay down, every time it’s possible, do it in a sit position, since it will prepare you for the other techniques. Once you get comfortable with abdominal breathing, it’s time to move forward to complete respiration. In this case, if you’re familiar with ujjayi, a yoga breathing technique, you can also introduce it. Complete breathing means that your breath into your belly, intercostal zone and chest when you inhale, and when you exhale abdomen, intercostal and chest zones go down. Ujjayi consists of contracting your glottis while you breathe both in and out. 6. Repeat 3 periods of breathing without retentions. Once you can calm your respiration and control, you’ll be able to slow down your mind and control your thoughts. Use these progressions of breathing techniques and get comfortable with your breathing improving calm and well-being in your life.